DanO from New Mexico Digital here, grateful to again be part of the 2008 Santa Fe Film Festival (SFFF). I love this festival. NM-Digital is pleased to be screening a short animated film called HINDMOST. See the Official SFFF HINDMOST Homepage for a slideshow and a Behind the Scenes short. 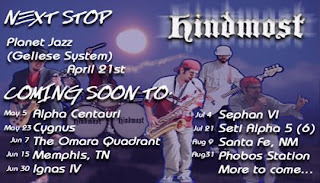 HINDMOST is a short film about a band called HINDMOST currently on a galactic tour called: 'The One Song Tour'. 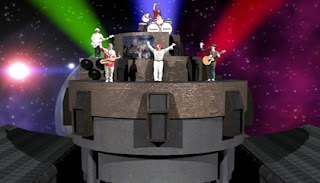 The band lands their spaceship into a packed stadium, plays one song, then takes off. I was really pleased with all the animation and graphic design by Jason Harris. He's quite a talented animator. Look for his work on future NM-Digital projects. Costume, make-up and camera-work was done by my son, Galileo Otero. How cool is that? And that left all the compositing, audio engineering and acting to be done by Dan Otero (your humble narrator). The Troll's Demise (2003); Zen & the Asteroid (2005) starring Santa Fe's Christopher Norris and Wil Albarez (aka FireHazard); and the famous SFFF 2006 protest video Fairness for Androids and Trolls (F.F.A.A.T. ), a mock protest of the 2 former movies. Good times. So that's the scoop. Hope you can catch my movie. I'll try to catch yours.